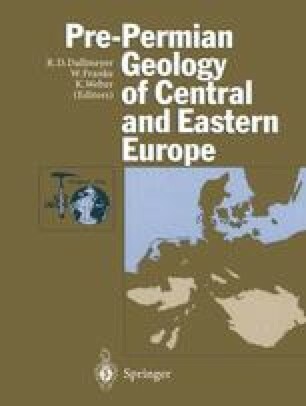 The geologic record of the late Proterozoic-Early Carboniferous has been represented in the Lugicum (West Sudetes) by a number of stratigraphic successions composed mostly of low- to high-grade metamorphic rocks, along with a wide range of igneous rocks and subordinate sedimentary rocks. The stratigraphic ranges of these successions are usually poorly documented, boundaries undefined, and their lateral spreads limited within small tectonic units (Fig. 2 in Chap. VI.A). This severely inhibits reliable chronocorrelations even between individual smaller units, the more so throughout the entire Lugicum. No wonder that such circumstances have resulted in many attempts to correlate individual units on various lithological bases, metamorphic grade inclusive, thus often bringing about dubious and/or arbitrary stratigraphie schemes. The following chapter therefore contains the actually known stratigraphie facts and mentions different, often contradictory, reconstructions of various local successions (Figs. 1, 2), without attempting at the moment an unwarranted generalization. The data presented below, though pointing to various flaws of current documentation, can be used to test both the models already proposed (e. g., Cwojdziński 1980; Michniewicz 1981; Don 1985; Aleksandrowski 1990; Matte et al. 1990), and those to come.